RPC-039 during "passive state" on 7/12/████. Containment Protocols: Attempts to relocate RPC-039 to Authority holding has proven ultimately unsuccessful on multiple different occasions. On 5/8/████, an unmanned, remotely-controlled K-class submersible was commissioned to attempt lifting RPC-039 from the sea floor. This resulted in the submersible malfunctioning due to lifting capacity overload. It was later discovered that RPC-039 weighs upwards of 80,000 metric tons, and though the Authority has experimental technology with possible lifting capability, the resource cost required to draft, fund and develop such technology is exceedingly large and would require a substantial chunk of the Authority's research income. This moved the Board of Global Directors to determine via Research Mandate ██ that this cost was disproportionate to the benefits gained by housing RPC-039. Disassembly of RPC-039 has been equally ineffective. 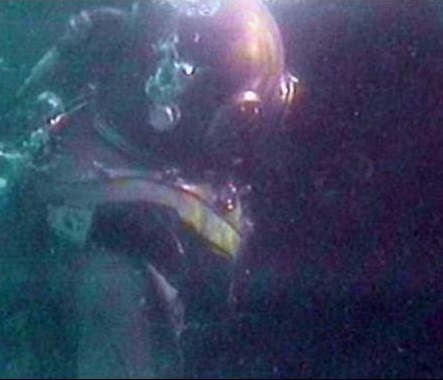 Incident 039-003 (an attempted removal of RPC-039's helmet from its dress on 3/3/████), caused submersible malfunctioning similar to aforementioned attempts to move RPC-039. In addition, various reports of rural unrest and spontaneous deaths of civilians increase subsequent to these attempts. Though such reports cannot be officially correlated with RPC-039, the Authority has suspended any and all relocation activities as Research Mandate ██-█. RPC-039 is instead to be surveyed via RV Agamemnon, the designated offshore research vessel stationed within a 1.5-kilometer radius of the relative sea-level location of RPC-039. Agamemnon requires at least five trained personnel apart of the Authority's Maritime Research Division, all of whom have knowledge of the vessel's passive temperature regulation and nautical surveillance systems that are necessary to observe and research RPC-039. Crew members are to be put on separate shifts for mornings and evenings, with morning personnel arriving at 7:00 A.M and departing at 5:00 PM (Irish Standard Time) to be replaced by evening personnel who will service Agamemnon until 12:00 AM when they are allowed to leave their shift. Crew members are divided into day personnel and night personnel shifts. Day personnel arrive at 5:00 AM (Irish Standard Time) sharp and will be required to maintain Agamemnon and are allowed to sign-off after 5:00 P.M. IST, when they will be promptly replaced by the night personnel who will operate the vessel from said time until 5:00 AM IST when the shift cycle repeats itself. In the case of RPC-039-A, Procedure ████-█ must be employed in order to procure thermographic and audiographic data from the event. Authority facility staff must be notified of any instances of RPC-039-A, and any data acquired must be sent to the appropriate department of the research division. Description: First discovered by the Authority in ████ off of Clogherhead, Ireland, RPC-039 resembles a deep-sea-diver, clad in a mottled brown standard diving dress complete with helmet, bonnet, and corselet. Although the exact origin of the dress is unknown, the helmet of the suit seems to have a three-bolt composition characteristic of 19th-century Russian naval diving gear. Despite having all the components of a fairly standard diving suit, RPC-039 does not have an attached diver's umbilical or air pump, so it is assumed by Authority researchers that there is no air being pumped directly into said suit. RPC-039 resides on the floor of the Irish Sea at a depth of 120 meters (~400 feet), where it walks at a steady pace of 0.7 meters per second. This speed has remained unchanged since its discovery, although the direction in which RPC-039 walks varies seemingly randomly. It does remain, however, within a (maximum) 10-kilometer distance to the coast of Eastern Ireland. For a majority of the time, RPC-039 is in "passive state", wherein it is simply maintaining its aforementioned walking pace. However, once every 2-3 weeks on a random day at a random time, RPC-039 will enter "active state". Active state involves RPC-039 emitting of a vertical beam of light energy (RPC-039-A) from the sea floor to the surface that has a radius of 5 m, shines at an intensity of 7,500 lumens, and lasts for around five minutes. Water lit by the beam (including the sea surface) will reach an anomalously high temperature with an approximate average of 130°C (266°F). The light (while lighting and heating up the water caught in it) dissipates once it reaches the air, and appears as nothing more than sunlight reflection outside of Authority observation jurisdiction. Even though no flagrantly verifiable changes (damaging or otherwise) to the surrounding environment have been observed during or after instances of RPC-039-A, local reports of increased health, sudden growth of otherwise decrepit crops, and similar events seem to increase onshore near to where said instances take place. Locals have noticed the pattern, but via information dissemination efforts by the Authority, general betterments have been chalked up to being nothing more than "gifts from God", and no connections outside of the Authority have been drawn to RPC-039.